Released in 1988 Night of the Demons instantly became a cult favorite, which has held up through the years. Night of the Demons was directed by Kevin Tenney who in the previous year 1987 made his directorial debut with the low budget horror film Witchboard, which became a surprise hit theatrically and continued to have success on home video. Kevin Tenney is a solid filmmaker and while he may not have the name value of other filmmakers he’s made some excellent films and none better than Night of the Demons, which is a terrific mix of humor and horror, though I do admit to having a soft spot for his 1999 film Demolition University, which starred Corey Haim and Ami Dolenz (Tenney would first work with Ami Dolenz in 1993 on Witchboard 2). The 80s were truly a great time in the horror genre and Night of the Demons very much has that 80s charm going for it. Its Halloween night and a few teens head out to Hull House, which was formerly a funeral home and a house to a mass murderer. When the teens hold a seance they awaken something evil. The screenplay by Joe Augustyn is quite interesting in the fact none of the characters are very likable (well sort of) as they’re all quite obnoxious and even one of the nicer characters turns into a bit of a jerk. Now this is something that should sink the film as characters like this only really work in an all out splatter flick. However rather than be annoying I actually kinda liked the characters. Sure they’re a bit obnoxious, but they they still come across as somewhat likable and quite fun, which helps Night of the Demons remain fun when there isn’t any action as the characters are able to carry the story. Augustyn’s script is well written and often quite fun. At first glance most would assume this would be a knockoff of Evil Dead, but you would be very wrong as Joe Augustyn does his own thing as does director Kevin Tenney. By this point in the 80s horror was still going well, but the writing more often than not was weak, but not here with Night of the Demons. As director Kevin Tenney sets up a really fun tone and crafts a well made and well paced film that works as both a comedy and horror film and despite how many other films do that a lot of the times one takes away from the other, but Tenney very much balances both and are each equally strong. It does take a while before any action kicks in, which is about the halfway mark, but most is saved for the final 30-minutes, however with that said the pace always remains strong due to the fun tone and eerie setting of the film. 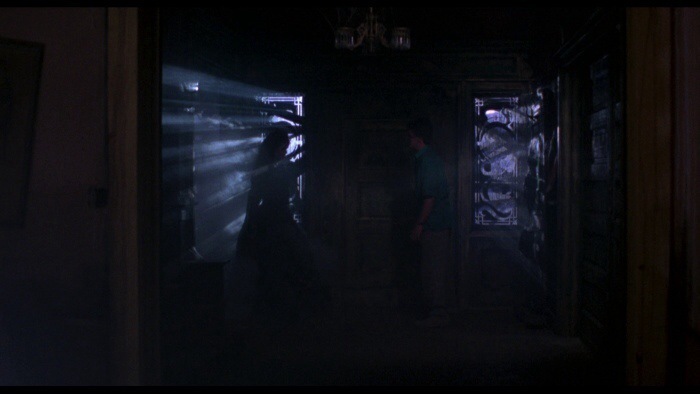 There is also some legit suspense as well in particular the final act, but even in those scenes Night of the Demons also retains the fun tone as again Kevin Tenney mixes both together very successfully. Night of the Demons is just a really fun film that is entertaining from start to finish. With a really fun tone and strong suspense it’s quite easy to see why Night of the Demons became such a cult favorite. With a solid script, excellent direction and a cast that gives energetic performances, Night of the Demons is very worthy of its cult status. Released by Scream Factory in a blu-ray/DVD Combo Pack on February 4th, 2014 this easily has to rate as one of Scream Factory’s best release. The blu-ray features an excellent HD transfer with an equally as strong audio track with a whole slew of great and informative extras including a documentary nearly as long as the actual film.